The Slit Counting Device (SCD) allows the physician to accurately maintain the incision count during recipient site preparation. This new medical instrument is offered for sale from Chadda Surgicals. SCD is reusable and comes in one unit - Blades and needles are included in the set. 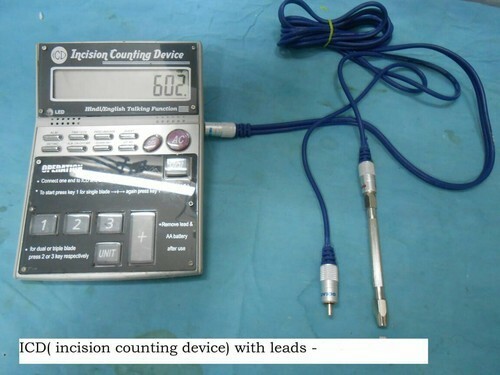 Description : The SCD features a display that maintains a 5 digit count of recipient site preparation and 3 different tips with depth control for pre-cut blades (0.8, 0.9, 1.0, 1.2, 1.4, 1.6 mm or needles (18G or 19G), depending upon your preferred method of recipient site preparation. Spare slit blades (pkt. of 50) can be ordered seperately. You can even fit 2 slit blades together in the handle (as shown in the picture). This revolutionary device is lightweight and ergonomic. With other methods, graft site preparation produces a crunching sound that often makes the patient feel uncomfortable and nervous. The SCD device produces signalling at a comfortable level for patients to mask the sound produced by graft site preparation. With this new automated technology, the physician can now communicate freely with the patient and his staff during the procedure. This frees your staff from counting grafts to cutting grafts, thus making your team more efficient overall. Finally, as most hair transplant procedures are billed on a per graft basis, the incision count accuracy of the CID is an effective way to eliminate counting errors and promote improved billing accuracy. In conclusion, the SCD offers many advantages to both patients and physicians. The tip and collets of the SCD can be sonicated and autoclaved for future usage. Established in 1985, Chadda Surgicals is a reliable organization, affianced in Manufacturing, Exporting, Wholesaling, and Retailing of Hair Transplant Instruments, Plastic Surgery Instruments, Micro Surgery Instruments, etc. The products are delivered by us, in compliance with the market set standards and extremely demanded by the customers. Additionally, we provide product variety to various specifications at inexpensive rates.